Just eight cases were detected in Liberia in the last week down from a peak of 500 a week in September. Guinea and Sierra Leone have also seen falls. 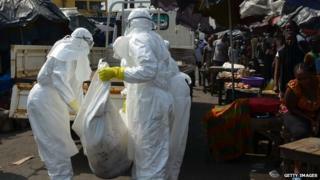 But it continues to urge caution, and to highlight the need to find those who had contact with Ebola patients. The largest outbreak of Ebola in human history has infected 21,724 people and killed 8,641 - largely in just three countries, Sierra Leone, Liberia and Guinea. There are now some days in Liberia where no cases are reported at all. Dr Christopher Dye, the director of strategy in the office of the director general, told the BBC News website: "The incidence is pretty clearly going down in all three countries now. "Each of the last three weeks has been the most promising we've seen so far, the message is reductions in all places. "I would have identified the turning point as the beginning of the decline, first in Liberia and then later in Sierra Leone and Guinea." However, he argued there was "no basis for complacency" due to the risk of a resurgence in cases. It is also uncertain whether the downward trends will continue unless there are improvements in "contact tracing". Yet the latest WHO situation report says the number of people being traced "remains lower than expected in many districts". Dr Dye added: "Contact tracing to find every last case needs to be intensified and we need all guns blazing on all fronts." Western Sierra Leone remains another problem. Of the 145 cases reported across all affected countries last week, more than 100 were in that region, which includes the capital Freetown. Speaking earlier this week, the UN system co-ordinator for Ebola, David Nabarro, said: "We have a very attractive and promising situation that leads us to believe that perhaps we are beginning to see the end of the outbreak. "Unfortunately it's not quite as simple and the reason for that is any case of Ebola in the region can restart an outbreak very quickly."